About Us and Mr. Tomonori Tomura, CEO, JMRI, LLC. A message from JMRI, LLC. We bring to you expertise based on cutting-edge initiatives and patented intellectual property; unique research and development derived from on-site observations and the realities of management, rather than a rehashing of the latest research in Europe or America; and things such as made-in-Japan initiatives that you will not find anywhere else and which are differentiated from others. When it comes to management, as well as our professional attitudes, we have consistently adopted a tireless approach of valuing norms as norms, while simultaneously re-examining those norms with scepticism from various angles to verify if they are truly appropriate. Based on a bottom-up management perspective, we take a considerate approach to our clients and those who approach us for consultations on their difficulties, and focus on whether we can be useful to society and to everyone before we think about profit or loss. We do our very best to contribute what little we can to society. As we receive the difficult and comparatively higher-priced requests made to us by large corporations with gratitude and honour, we use the funds from these requests to handle cases and free consultations for activities that contribute to society or organisations working for the public interest, such as agencies and associations including mother-child welfare centres, the Japan National Council of Social Welfare, and medical welfare organisations. We do so without consideration of profit, even if it takes private contributions on our part. This is something we have often been asked about by reporters during interviews with the media: rather than adopting a style of management that smells of ulterior motives or the glitter of money, in which higher sales or going public is the objective, we have consistently prioritised tirelessly and carefully tackling what is needed by our clients and by society. Although our corporate form is that of a for-profit business, we would like to promote publicly beneficial and socially meaningful activities more than even public or administrative agencies, NPOs, or NGOs; we create the funds for these activities through our for-profit work as well as our own private contributions rather than relying on sponsors, donations, or subsidies, thus remaining self-reliant and increasing our financial and mental independence. From this point forward, we will continue to work together with our partners and with other companies with our core business of solving society's problems and contributing to society as "artisans of wisdom" at our base, while sticking to what is right with neutrality and fairness and adopting a stance of "harmony, not conformity" founded on our cooperativeness, independence, and objectivity as professionals. We look forward to working with you. Mr. Tomonori Tomura, CEO of JRMI, LLC., is the third-most popular lecturer in Japan (note). He explains things that seem difficult at first glance in a way that makes them digestible and enjoyable, and his ability to expose the depth of things we tend to overlook through his lectures and coaching is popular in many places. As an "artisan of wisdom" ([R] Tomura), Mr Tomura brings new awareness to audiences, from fresh and original strategies and management techniques to adapt to upheavals in the management environment, to new perspectives and interdisciplinary approaches to even standard topics. He has deployed the three pillars of his work - namely lectures and training (120 lectures per year); writing (33 books as of now, as well as magazines, newspapers, and other submissions and serialisations); and his work as a management advisor - on various topics around the country, including in private businesses, government administration offices, self-governing bodies, medical welfare agencies, IT organisations, labour unions, the Chamber of Commerce and Industry, police headquarters, the National Tax Agency, audit commissioners and audit commission secretariats, and the Social Welfare Council. He receives many repeat requests. He is vigorously active in TV and radio appearances and magazine serialisations, not to mention as a collaborator in the direction and production of TV programmes and a speaker at large-scale panel discussions. He is from Osaka City at Osaka Pref. in Japan. He graduated from Waseda University and obtained an MBA and joined Ph.D course in the US, where he received an award for excellent graduate students across America based on the recommendations of faculty and the university president; this award is given to the top 0.5% of graudate students in the US based on grades as well as character evaluations. He has also worked in the United Nations. Among other roles, he has been a specialist in the UN Office of internal audit, a specialist leader of UN missions' strategist, and a special trainer for UN staff; he has also handled Public Relations and promotion to businesses for the UN Global Compact, a global CSR initiative spearheaded by the UN. In this international workplace, he has encountered and applied diversity and inclusion; global human resources development; compliance; risk and crisis management; audit leadership; management ethics; and human rights and ethical leadership. In Japan, he has handled diversity and inclusion (D&I), compliance, internal audit, and risk and crisis management; he has led, implemented and experienced the process of ensuring compatibility with world standards in these areas before they received attention in Japan. In the private sector, he has been an executive who supervised human resources and audits; a part-time lecturer in the graduate school of Okayama University; a director at the Japanese Association of Administrative Science as well as the president of its East Japan research division; a consultant at the Nippon Omni-Management Association (NOMA); a consultant at the IT company KK Ashisuto (representative director: Bill Totten); an advisor at the publicly listed IT company JFE Systems; a consultant at the Nagano central branch of Japan Agricultural Cooperatives; an executive advisor at the human-resources subsidiary of a major firm; the manager of a summit hotel; the first compliance committee chairman of the Japanese branch of the Aircraft Owners and Pilots Association (AOPA), a global organisation of pilots of civilian private aircraft and others; as well as the supervisor of the Earthquake Recovery Support Forum in Tokyo, among other roles. He has also been a consultant for Universal Aviation, a global network business among the top in Japan which manages the operations of private and business jets. As the chairman of the Corporate Governance Awards (CG Award), he is also the chairman of the selection committees for prizes such as the Courageous Governance Award, the Courageous Auditor Award, and the Courageous Whistleblower Award. As for leadership, he has taken the podium in a wide range of industries, from listed industry-leading major firms to key SMEs and electricity and infrastructure firms, as well as government administration offices and organs and local governments, where he has given keynote speeches at extension lectures and provided ethics and human rights training. He has also given keynote speeches at forums and events, at industry groups, and at the Chamber of Commerce and Industry, and spoken at medical welfare organisations, nursing associations (second-level courses for supervisors), labour unions, Japan Agricultural Cooperatives (JA), and the Junior Chamber International Japan. He has been a specialist among lawyers, certified public accounts, medical professors, and the consultants of major consulting firms, and a lecturer who has coached the management ranks of various listed major corporations. - He is engaged in a wide range of coaching and writing based on his experience in the UN of leading and implementing the areas of compliance; internal controls; diversity and inclusion; and work-life balance, which is a form of the previous (in terms of the diversification and adaptation of ways to live and work). - As he was healed by the presence of his young child, he began to think not just about how to educate his child but about how to prepare an environment in which his child could naturally learn by himself as he turned 10 and 20. He began to consider: what if I focused less on indoctrination - on putting knowledge in his head - and more on cultivation, or on plowing the soil for him to develop by supporting his ability to learn and grow on his own? - At business seminars and events organised by our company, we are committed to advancing diversity and inclusion through measures such as a kids' space behind the meeting place; spaces without chairs in relaxation areas to allow visitors in wheelchairs to participate smoothly and enter without having to leave their wheelchairs; mats to allow Muslim guests to pray on-site during seminars; as well as accommodations for LGBT visitors. However, our measures are not complete, and our chairman is pained by the fact that sign-language or Braille materials are not available, and that compatibility with many languages, not just English, is lacking. - As a pilot, he has experienced four engine failures in the air and survived. Because of this, he personally experienced the importance of crisis management, and keenly felt that in risk and crisis management it is important not just to understand but to be able to turn principles into reality. This is something he has brought into his coaching. - An opinion text by Mr Tomura on the North-East Earthquake in Japan (2011) and the problem of self-restraint with regard to cherry blossom viewing was used as a test question in the Japanese Language Proficiency Test (JLPT), which is carried out in many countries. It was a question on the old Level 1, and now on the new N1 level. - He received an urgent request for PR crisis management from the president of an entertainment agency about the scandal of one of the stars under its management. After his honest management of the matter, the issue was covered by only one magazine and did not get out of hand, and the star is still active today. - A huge consulting company transferred an advisory-services contract to just Mr Tomura alone: a listed major company changed a large consulting contract whose content did not match to Mr Tomura, naming him individually and requesting all advisory services from him. - With regards to coaching on complaint resolution, including in serious situations, he receives no remuneration or benefits to avoid acting illegally by practising law without a license, and provides instruction to publicly beneficial organisations on crisis management techniques to deal with difficult complaints. After his coaching, these complaints are resolved peacefully after aboveboard and official responses. - We use the money we receive as a business in a variety of ways, such as accumulating funds from large-scale keynote speeches for requests from Dentsu or Hakuhodo and using them for activities that contribute to society. - His experiences in the Kobe Earthquake of 1995, 9/11 in the US, and the North-East Earthquake of 2011 made him personally feel the importance of crisis management, business continuity (BCP/BCM/BCMS), and habitual risk management. His home is equipped with stockpiles for disasters and earthquake-resistant equipment. - He is proactively involved in activities that contribute to society, such as by providing coaching, speeches, and collaboration at extraordinary expense to clients involved in publicly beneficial and socially meaningful activities, including public awareness activities and publications for charity on risk and crisis management and internal controls. He uses funds made through his core business for these activities, and even adds funds from his own pocket. He possesses many proposals, items of intellectual property, and developments in management techniques that no one before him has ever been able to accomplish. - He is at the cutting edge in advocating, presenting at a conference, and publishing a fourth-generation balance scorecard that balances revenue strategy with risk management and applies them to corporate governance. His article on the subject was published in the American BP Trend magazine. - Since long before the North-East Earthquake in Japan, he has been at the cutting edge in proposing a crisis-management cloud that applies cloud computing to disaster recovery. He has presented this idea at conferences, as well as published it. - He is at the cutting edge in developing an IFRS impact map, which studied the changes created by the International Financial Reporting Standards (IFRS) from a management perspective, and has published it as part of IFRS literacy. - He is at the cutting edge in developing and advocating a big data impact and strategy map that consolidates from a management perspective how to strategically make the best use of big data in management, and spoke on the subject in his keynote speech at CEATEC JAPAN 2014. - As a cutting-edge AI, IoT, big-data strategist, he provides coaching on big-data strategy from a management perspective. - He has been at the cutting edge in developing a tool to study the implementation status and awareness regarding internal controls in compliance with the Japan version of the COSO model. This has been published in the national Mainichi Shimbun paper. - He has been at the cutting edge in advocating and presenting (e.g. at CEATEC JAPAN) risk-management big data, and has supported the use of cloud computing for disaster prevention, reduction, and recovery as well as risk and crisis management since before the Great East Japan Earthquake; he has been invited to speak on this topic at the International Academy of CIO. He is a world opinion leader, as after the disaster, Japan's IT vendors all released solutions in accordance with the crisis-management cloud advocated by Mr Tomura. 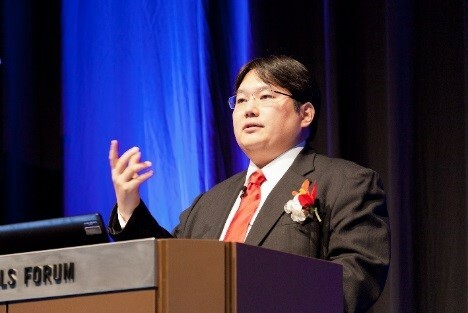 Although his ideas of risk management and disaster-prevention strategies through the cloud were originally laughed off by leading professors in the field of IT as well as by IT analysts, he soberly persisted in spreading public awareness, and today it is impossible to discuss cloud computing in Japan without mentioning the crisis-management cloud. Later on, he came to realise that there is no one less trustworthy and more opportunistic than experts and scholars, as they quickly changed their attitudes and drew close to him, claiming that they had believed he had foresight all along. He also came to feel that what is really preventing innovation and hindering new growth strategies is vested interests as well as the self-protection, prejudices, fixed ideas, and old-school loyalties of those with authority who act as they like. - He was at the cutting edge in developing, advocating, and publishing "Audit Communication Techniques". - He was at the cutting edge in developing, advocating, and publishing "Audit Management Techniques". - He was at the cutting edge in advocating and publishing "Audit Psychology". - He was at the cutting edge in establishing the Courageous Auditor Award to honour auditors. As many auditors tend to fall into the trap of being too willing to let things slide, he strives to nurture auditors with a healthy and appropriate sense of balance, who play a key role in shouldering the heavy responsibility of corporate governance. - He was at the cutting edge in establishing the Courageous Whistleblower Award to honour whistleblowers. As whistleblowers and complainants are cast out from society and seen with bias the more they do the right thing, he aims to express respect to those who stick to what is right, as well as create an atmosphere that does not instigate mischievous reports but supports people who do the right thing for society, in order to solve the problem of exploitative businesses as well as the decrease in whistleblowing for the public good due to the State Secrecy Law. - He was at the cutting edge in advocating, publishing, and providing coaching on "Integrated Internal Governance", a unified management approach that combines corporate governance with internal controls. - Appeared on and supervised NHK's "Close-up Gendai"
- Appeared as an expert guest and assisted in production of NHK (Educational TV)'s "Mezase! Kaisha-no-Hoshi"
- Supervised and provided guidance on easily understandable explanations on TV Asahi's "So that's how it was! Akira Ikegami's educational news"
- Appeared as a commentator on the BS11 news programme "Inside Out"
- Appeared as a commentator on MX TV's "Golden Hour"
- Collaborated on the production of NHK's "Kangorongo"
- Appeared as a commentator on FM Tokyo's "Chronos"
- He has also produced many magazine serialisations, been involved in interviews (such as for the weekly Diamond and the Nikkei), and submitted articles (such as for the weekly Diamond). He has written 33 books. He has many works, both commercially published and published for charity. "The Deterioration and Rebirth of Corporate Governance" (Chuo-keizaisha) and more. His coaching is popular for its mix of hard and soft based on the target audience, ranging from academic papers to introductory books and management guidance explained through four-frame comics. - Police headquarters in Shizuoka prefecture: training for the general manager, the chief and deputy chief of police, and management on "Anger management strategies: fundamental strategies based on diversity and inclusion"
- Organised by Tokyo City: Tokyo Job Ore! Special lecture: "7 points for looking for a job that suits you and finding happiness"
- The Ministry of Health, Labour and Welfare: "Systems to support young people's careers"
Towards the development of a healthy corporate governance and societal landscape for Japanese businesses, I created the Corporate Governance Award to honour those who have taken steps down the path to better corporate governance, so that Japanese businesses can take sure steps towards higher corporate value and adapt to global and societal demands, including through healthy corporate governance, internal controls, and risk management. In 2012, I gave out the Courageous Auditor Award and the Courageous Whistleblower Award (both trademarks of Mr Tomonori Tomura) for the first time in Japan, and hosted a special panel discussion at the 2012 Corporate Governance Forum. In 2013, I created the Courageous Governance Award for those who have made proactive steps towards corporate governance, and have been honoured with widespread participation and support. It is my hope that I can play a role in the creation of an atmosphere that supports and encourages those who take steps towards corporate governance that is beneficial to society. As large businesses once recognised as superior went through one scandal after the other, auditors take the countermeasures that must be taken, and internal complainants and whistleblowers attempt to put wrongs right; yet sometimes those who have done what is right experience retaliation from organisations and businesses and are cast out from society. There are cases when those who have done wrong experience what is known in audit psychology as "the reversal of victims and offenders" with regards to those who have done right. They treat those who have identified problems in audits or made internal reports to rectify wrongs as "traitors", and act as though these people were the true offenders and the ones who have done wrong were the true victims. A system such as that of the US regarding whistleblowing in the public interest, in which a monetary reward is given to whistleblowers, means that a certain reward exists for correct behaviour, and the person will probably not need to worry about his or her livelihood. However, Japan does not have such a system, and it is feared that whistleblowers will be cast out from both their companies and from society, and an environment that encourages doing the right thing will not develop. Therefore, although this project may not offer tangible gains such as reward money, I planned and organised it in the hope that it could send a message of societal support to individuals and businesses who persist with what is right in the face of personal danger and risks to their livelihood, and thus become the trigger for changes in the societal environment, no matter how slight. This award does not guarantee that individuals or organisations selected for it have no hidden facts in their past, or will continue to act in a healthy manner in the future. ・Was the action, report, or complaint a courageous one that was not made from self-interest? ・To whom was the action helpful, such as to victims or society? ・Was the action, report, or complaint not a publicity stunt or an act of revenge? Based on information from recommendations by advisors as well as through voting, we select individuals and organisations whom we think would be most appropriate to provide societal support - from our company, although this may be presumptuous - to those who have had courage in their pursuit of what is right. The awards are not necessarily decided by the scale of reporting on the event, or by the size of the impact. We also do not intend to instigate abuse of the right to make reports or of the rights of auditors. These awards do not have an exhaustive grasp of the activities of every manager, auditor, and whistleblower in Japan, and in order to avoid bringing unnecessary anxiety or suspicion to those involved, they are primarily based on information that has been made public. Therefore, it is our wish as well to recognise and to send support to the "nameless warriors" who are involved in disputes that are not publicly known, but in which they are pursuing what is right. The hope of Mr Tomura, the supervisor and chairman of the award committee, is that this award will be evaluated correctly by society, neither as a prize that curries favour with businesses and organisations nor as one that mischievously instigates trouble, but as an important initiative that strengthens the self-cleansing abilities of governing and internal self-governing bodies. CEO, Japan Management Research Institute, LLC.